The 2008 Le Mans 24 Hours produced one of the most exciting finishes in years and ended with Team Peugeot Total securing its second consecutive second place with the Peugeot 908 HDi FAP in the famous endurance race. The N°7 car shared by Marc Gené/Nicolas Minassian/Jacques Villeneuve emerged from the rainy early morning as the team's best chance for victory and the trio never gave up the chase. 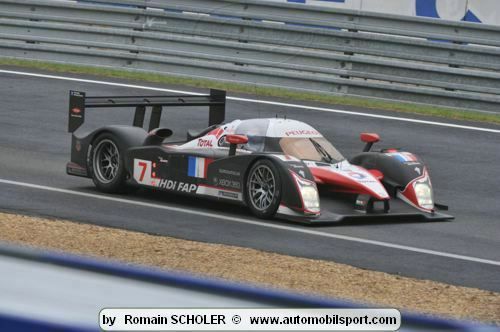 The N°7 car was joined on the podium at the finish by the N°9 sister car of Franck Montagny/Ricardo Zonta/Christian Klien, while the third Peugeot 908 HDi FAP made it three cars in the final top-five. Inevitably, however, there was a sense of frustration within the team for not having succeeded in pulling off what it saw as its principal challenge of the 2008 season. Despite the disappointment of not reaping the rewards of all the effort and energy invested in what was always seen as the highlight of Team Peugeot Total's 2008 programme, the Peugeot 908 HDi FAPs lost no time in revealing their competitive potential by qualifying on the first three places of Saturday afternoon's grid. 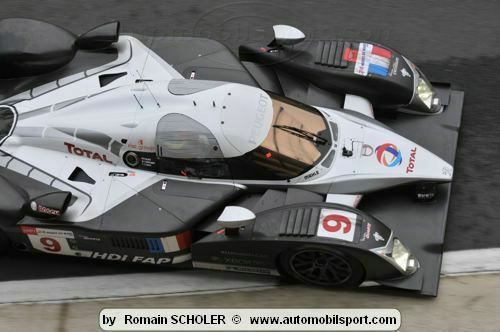 The Peugeot 908 HDi FAPs then went on to practically dominate the first 14 or so hours of the race. 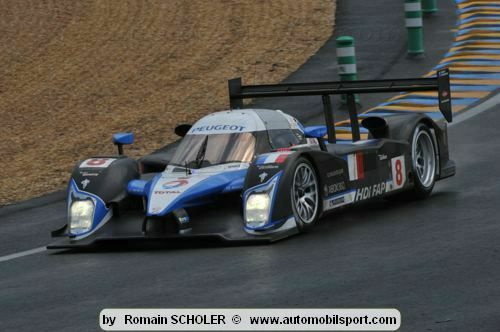 The N°8 Peugeot of Lamy/Sarrazin/Wurz emerged as the early pace-setter during the first two hours, but it then fell back after suffering a gear selection problem which took six laps to resolve. The N°7 car briefly inherited top spot before allowing the N°9 Peugeot of Montagny/Zonta/Klien to move into the lead following an incisive quadruple stint from Franck Montagny. As night began to fall, however, then leader Christian Klien (Peugeot N°9) was nudged into a gravel trap while overtaking a slower competitor. The N°7 sister car profited from the incident to ease into the provisional lead shortly after 10pm. 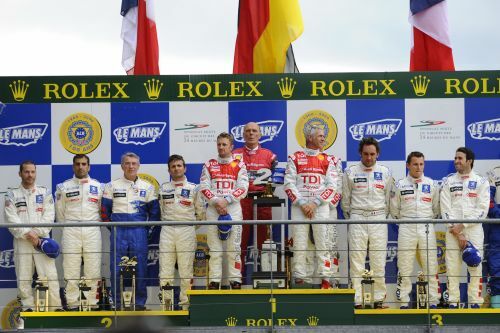 Marc Gené, Nicolas Minassian and Jacques Villeneuve consequently led the 2008 Le Mans 24 Hours for much of the night, even when rain began to fall over the French venue shortly after 4 o'clock in the morning, although this change in the conditions gave their rivals a new lease of life. By 5.17am, the N°2 Audi was in front, and it then profited from the wet weather to gradually extend its advantage. Meanwhile, Franck Montagny (Peugeot N°9) succeeded in stealing third place back from the N°3 Audi. The ferocity of the race became more intense when rain started to fall again over certain portions of the track with one hour remaining. With nothing to lose, Nicolas Minassian decided to stay out on slicks while the N°2 Audi stopped to fit rain tyres. It was a gamble but, in the end, the gap between the top-two cars remained basically unchanged all the rest of the way to the chequered flag. Team Peugeot Total nonetheless left Le Mans with a spectacular record to its credit: that of the fastest ever race lap in the 24-hour classic which was the work of Stéphane Sarrazin on his 102nd lap of the 13.629km circuit which he covered at an average speed of 246.068kph in the N°8 Peugeot 908 HDi FAP. In doing so, he also came within a whisker of the benchmark lap-time of Jackie Oliver which stands since 1971 (a 3m 18.4s, but posted without the Hunaudières Straight chicanes!) thanks to a 3m 19.394s on Saturday evening!